Enjoy Woodlawn’s afternoon high tea in an enchanting setting. 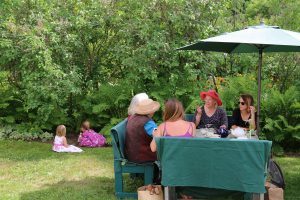 Catered by Flexit Café and Bakery, Woodlawn’s high teas are a long-standing tradition that have been delighting guests for many years. The cost for the high tea is $22 for Woodlawn members/$25 for non-members and includes your visit of the Black House. View the tea menu here. Space is limited. Pre-registration is required. In addition to the program fee, a $1.50 processing fee will be added to all credit card transactions.